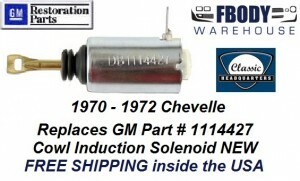 This is a GM authorized reproduction air induction flapper solenoid for your 1970 1971 1972 Chevelle with cowl induction hood. Accurate high quality reproduction cowl induction solenoid reproduction includes imprinted part number on case as original. SHIPPING AVAILABLE WORLDWIDE ON THIS ITEM. USE THE DROP DOWN BOX BELOW TO SELECT SHIPPING LOCATION.